Hot water Camp shower; I do not know a single person that would say, nope don’t like em’…. Yeh guess you haven’t either. But that’s the thing, it’s normally one of the biggest things we go without while out bush for days on end. I’ve always kept wet wipes as a substitute for a shower on my 4wd trips but spending extended periods overland, I needed a solution. What I came up with was a hard mounted Camp shower system, complete with a Marine heat exchange and a quality FloJet pump to give me hot water on demand when heading bush, all mounted neatly under the bonnet. These units first connect into your vehicles heating circuit through the heat exchange and then the pump’s pick up water from a source, whether that be containers stored in your 4wd or a natural source like a river, stream or creek. (Yes you heard that right endless hot water showers out bush if you have a clean natural water supply) and push through the exchanger warming the water and pushing it out your shower rose! One other important accessory is a sand spear filter which means you can draw water from a sandy creek bottom without drawing sand through the pump, which is the quickest way to ruin your new investment! The special design allows water to flow while keeping sand out – pretty neat and a must for those creek side camp shower stops. While heat exchangers generally are a completely sealed unit, unless you have a marine grade submersible water pump, attention needs to be drawn to the potential for damage, in river crossings and the like. For those who frequent bonnet deep crossings, definitely look out for a marine pump for your system to ensure no nasty surprises when you go to use your shower at camp! The beauty of this, is no matter how much rolling around in the mud or getting the car unstuck during the day you can be confident a hot water shower is never far away! - 4wd has a working heating system, now is a good time to replace hoses and keep spares. - Ample room to mount both a heat exchanger and pump under bonnet, or within close vicinity of your heating system. - A QUALITY kit is used. Inferior products corrode and directly impact your cooling system. A Marine Grade heat exchanger and a quality 12 V pump is what you need. - Water storage – Pumps do have a number of flow ratings and the ratio to get the desired temperature will depend on the heat in your engine, revs and your ability to adjust via the shower rose mixer. Newer cars don’t have the heater valve adjustment, so varying revs does the trick in this situation. You will learn the sweet spot in time for your application. - Tidy and neat wiring of the 12V pump to a switch. 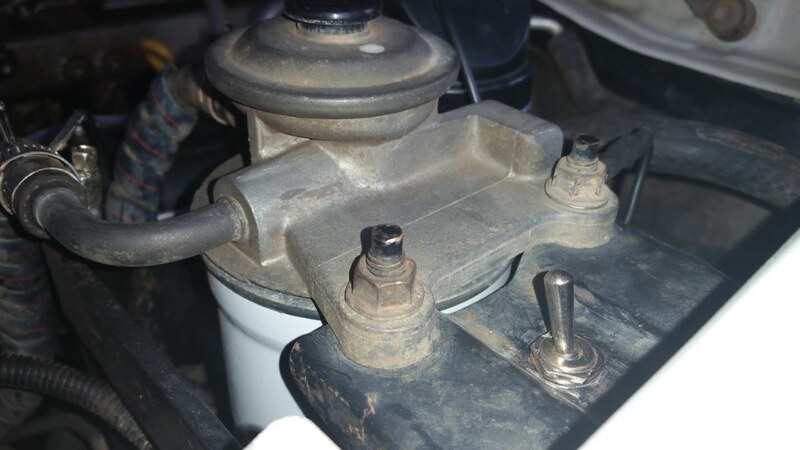 We have mounted ours on top of the fuel filter bracket for easy access. We have heat shrunk and crimped joins with electrical connectors, and used a quality switch for our unit. 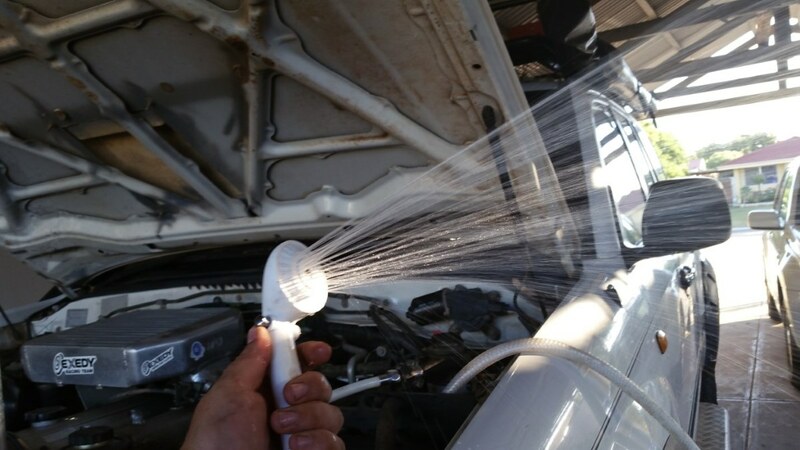 - Keep original cooling system hoses in your vehicle at all times, in case of a leak, you can bypass the system! - Ensure the routing of your heater hoses prevents kinks in the hose itself, and the hose does not run along abrasive surfaces, or rub! There are a number of brands out there which a quick google search will take care of. Even EBay has some kits listed. It pays to do your research on what will work for you and fits your budget. We use a Glind hot water system (Original) and they are well-regarded using quality components to their kit. In this day and age of 4wd accessories, alongside the 12v fridge, pull out awnings and Led strip lighting, I would rate my 12V camp shower as one of the best mods I have EVER made to my 4wd! Not only does it keep the missus happy (okay it keeps ME happy), but keeps me comfortable out bush longer, and that is what it is all about. More time wandering this great country. Leave Camp Shower And Go 4 Wheeling In Western Australia.